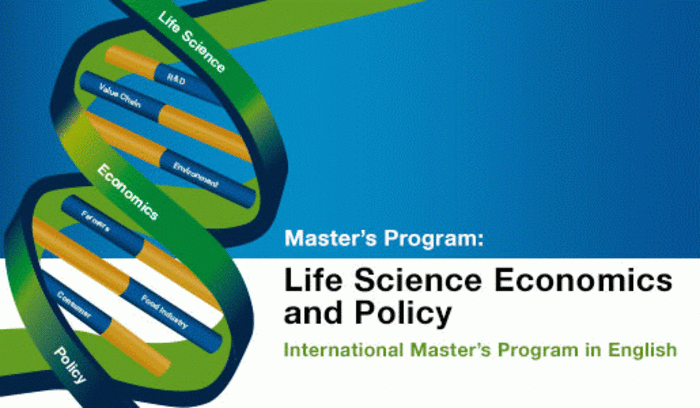 Welcome to the Master's Program 'Life Science Economics and Policy' ! IMPORTANT: Due to the restructuring of the Master of Life Science Economics and Policy there will be no intake of students in the Wintersemester 2019/2020. We hope to re-open the application process for the Wintersemester 2020/2021 in January of 2020. The international Master’s program M.Sc. in Life Science Economics and Policy (MLSEP) is offered at the Technische Universitaet Muenchen / Technical University of Munich (TUM) in Bavaria, Germany. This two-year, full-time program starts in the winter semester (October) only and is taught in English. The application period is from 1 January to 31 May. Applications are done online. There are no tuition fees, but student union and basic semester ticket fees are payable. The MLSEP program integrates economics and policy with the life sciences. Graduates acquire knowledge and competencies to work on societal challenges within the bioeconomy like food security, regulations, climate change, environmental degradation, and the growing demand for energy, food and raw materials. These issues require innovative solutions with appropriate regulatory frameworks and policies. Compulsory modules lay the progarm's foundation. Students choose elective courses from a wide range of subjects both in the social- and natural sciences, are required to go on an excursion, and to do a research project (or an internship). One General Education (neither social- nor natural science subjects) course worth 5 credits is mandatory. The program concludes with the writing of a thesis and its defense (a colloquium). At least 120 ECTS credits (European Credit Transfer and Accumulation System) must be passed for this Master of Science (M.Sc.) degree to be awarded. Studying abroad at a partner university is an option. TUM's International Student Guide booklet and the MLSEP flyer are available for your convenience.